Trent Smith and Moore Metal wowed the crowd with an amazing 226 point run to claim the victory and become the 2016 Bayer & Shadow Trailers NCHA Australia Open Futurity Champions at Tamworth last week. 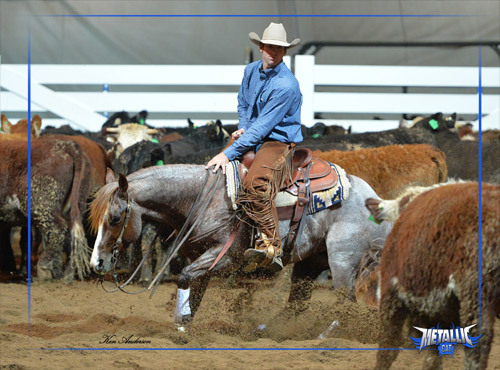 It capped off a big week for the Young horseman, who also took out the SDP Buffalo Ranch Open Derby Finals on Metallic CD and the Longyard Hotel Limited Open Futurity Championship on Metallic Bling. Smith completed the trifecta of three championship events, all on horses sired by Metallic Cat. The three wins and other multiple finalists all added up to a payday worth over $100,000 including the guaranteed $75,000 for winning the Open Futurity.